I thought it was time I started exploring Repast Simphony and GIS data for US. So following the excellent tutorial by Nick Malleson entitled "RepastCity - A demo virtual city" which demonstrates how to load up several shapefiles and move agents around a road network (the code is also very well documented). The movie below shows the George Mason campus (2005). The GIS data comes from the GMU Library in the form of shapefiles. Within the model we have agents (red stars), one for each building (black polygons). 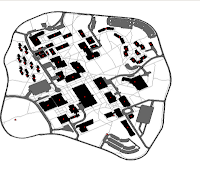 These agents choose a building at random and use the footpaths (thin grey/blue lines) to navigate to the chosen building. Additional layers are also represented including: car parks and roads (grey/blue areas); and streams grey blue) and a pond (green)1. Another interesting tutorial is by Karl Liebert which discusses how create a basic GIS model in Repast Simphony. 1 For some reason the colors have been messed up in the conversion from computer to Vimeo. I just come across another interesting NetLogo model while browsing through the interesting Electric Archaeology: Digital Media for Learning and Research blog written by Shawn Graham. Shawn along with James Steiner (who has a great site called turtleZERO) have created a agent-based model called TravellerSim which explores growing settlement structures and territories. 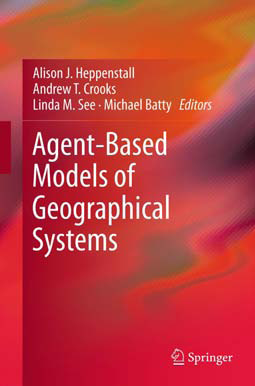 "Agent-based modeling presents the opportunity to study phenomena such as the emergence of territories from the perspective of individuals. 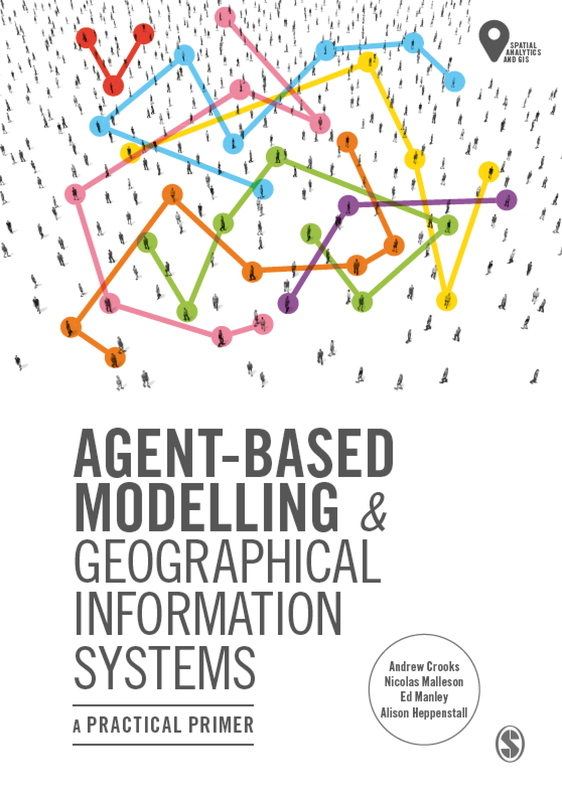 We present a tool for growing networks of socially-connected settlement structures from distribution map data, using an agent-based model authored in the Netlogo programming language, version 3.1.2. The networks may then be analyzed using social-networks analyzes tools to identify individual sites important on various network-analytic grounds, and at another level, territories of similarly connected settlements. We present two case studies to assess the validity of the tool: Geometric Greece and Protohistoric Central Italy." 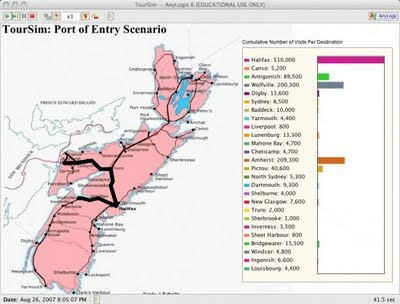 Graham, S. and J. Steiner (2008) “Travellersim: Growing Settlement Structures and Territories with Agent-Based Modelling” in Jeffrey T. Clark and Emily M. Hagemeister (eds) Digital Discovery: Exploring New Frontiers in Human Heritage. CAA 2006. Computer Applications and Quantitative Methods in Archaeology. Proceedings of the 34th Conference, Fargo, United States, April 2006. Budapest: Archaeolingua. The NetLogo model can be found here and the blog post here. Furthermore, Shawn has a number of other agent-based models which might be of interest. These can be found here. Following on from our previous posts on Second Life (SL), I just came across a post on the ArcUser Online website which talks about how SL can be used for GIS education. The article is by Michael DeMers of New Mexico State University. The paper is entitled "Inside the Metaverse" and has three nice podcasts accompanying it. The YouTube movie below gives an idea about the potential for teaching GIS within virtual worlds (Thanks to Digital Urban for the link). "Urban models can be seen on a continuum between iconic and symbolic. Generally speaking, iconic models are physical versions of the real world at some scaled down representation, while symbolic models represent the system in terms of the way they function replacing the physical or material system by some logical and/or mathematical formulae. Traditionally iconic and symbolic models were distinct classes of model but due to the rise of digital computing the distinction between the two is becoming blurred, with symbolic models being embedded into iconic models. However, such models tend to be single user. This paper demonstrates how 3D symbolic models in the form of agent-based simulations can be embedded into iconic models using the multi-user virtual world of Second Life. 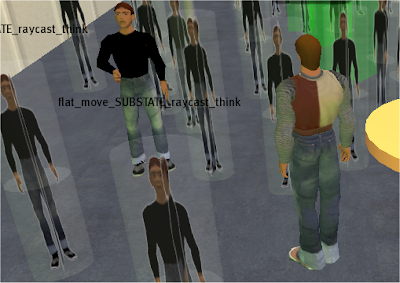 Furthermore, the paper demonstrates Second Life's potential for social science simulation. To demonstrate this, we first introduce Second Life and provide two exemplar models; Conway's Game of Life, and Schelling's Segregation Model which highlight how symbolic models can be viewed in an iconic environment. We then present a simple pedestrian evacuation model which merges the iconic and symbolic together and extends the model to directly incorporate avatars and agents in the same environment illustrating how 'real' participants can influence simulation outcomes. Such examples demonstrate the potential for creating highly visual, immersive, interactive agent-based models for social scientists in multi-user real time virtual worlds. The paper concludes with some final comments on problems with representing models in current virtual worlds and future avenues of research." Accompanying the paper we have created a dedicated website giving more details about the work including the model source code which can be found here. Our next steps are to start exploring how such models can be created and extended in OpenSim and carrying out user testing along with online model creation. Crooks, A, Hudson-Smith, A and Dearden, J (2009). 'Agent Street: An Environment for Exploring Agent-Based Models in Second Life'. 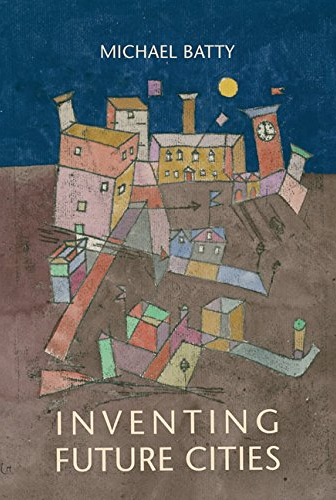 Journal of Artificial Societies and Social Simulation, 12(4)10: http://jasss.soc.surrey.ac.uk/12/4/10.html.